Ajay Devgn, Rohit Shetty and entire team of Golmaal Again are shooting for the fourth instalment of the comic franchise at Yash Raj Studios in Mumbai. Amidst the shoot, the team had a special guest on the sets. Sanjay Dutt, who just returned to Mumbai after a hectic schedule of his film, Bhoomi, visited the set of Golmaal Again. The actor has worked with Devgn in films like Rascals, Son of Sardaar, and All The Best to name a few and their friendship goes way back to the 90’s. Dutt’s presence on the film set has given rise to the speculation of a probable cameo however there is no official word on the same as yet. 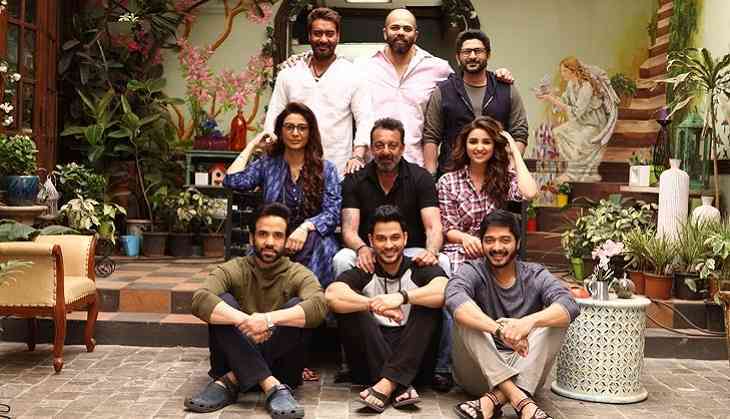 Directed by Rohit Shetty, Golmaal Again also stars Parineeti Chopra, Tabu, Arshad Warsi, Tusshar Kapoor, Kunal Khemu and Shreyas Talpade in pivotal role. The film is slated to release by end of 2017.